Morning classes are for babies and pre-school children - $20 per lesson. Afternoon classes are for school-age children - $22.50 per lesson. Saturdays accommodate babies, pre-school and school-age children - $22.50 per lesson. Our classes are held all year round and follow the Victorian school term dates. No classes during school holidays. No classes are held on public holidays. Class fees reflect that there is no swimming on public holidays. Students normally attend one class per week. A parent or guardian is required to be in the water for baby classes up until the age of 3. Pre-school and baby classes have a maximum of 4 children per teacher. School-age classes have a maximum of 5 children per teacher. Most of our students do group classes. Group classes are 30 minutes in duration. Semi private and private lessons are usually 15 minutes in duration. Swimming caps are compulsory and goggles are recommended in all classes except baby classes. Babies should wear swim nappies. These items can be purchased at New Wave Swim School. We have lots of spares just in case you forget your own. All other equipment is provided. Certain health funds subsidise swimming lessons. 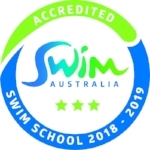 New Wave Swim School is registered with them all so please check if you are covered and if so we can provide you with the correct paper work for you to claim. Classes are paid for in advance for a whole school term, unless alternative arrangements have been made. To secure your place, a 2 week deposit is to be paid. The remainder of the fees are due by the 2nd lesson of the term. We accept cash, card and direct bank transfers. No charge, interest free payment plans are available on request. Enrolments are taken at any time throughout the term and term fees are prorated. Our classes for school age children are grouped by ability, therefore we need to assess each child in order to place them in the best possible class. Assessments are scheduled regularly throughout the term and are free of charge. Assessments allow the parent and child the opportunity to visit our swim school and see it in action without any obligation. During this time you are able to meet us and we can discuss your child's individual swimming requirements. After the assessment we will be able to recommend the best possible class for your child. Please contact us in order to arrange your assessment. We will get back to you as soon as possible. There is no requirement to undergo an assessment for babies or pre-school age children. We offer a free trial lesson so that you are able to get to know us. This trial lesson can be held on any day to suit you. If you would like to enquire about baby or pre-school age classes please get in contact and we will be happy to arrange your free trial lesson. Heated indoor pool, specifically designed for learn to swim lessons. Pool temperature of 32 degrees in summer and 34 degrees in winter. Male and female changing rooms, hot showers and baby change tables available for use. Non-slip rubber mats around pool deck and in bathrooms. De-humidification system which means minimal moisture in the ambient air. Play area with toys and books is available to use when not attending a lesson. Goggles, towels, backpacks, swim nappies and all other swimming accessories are available for purchase. We also have lots of spares just in case you forget your own. Free mobile phone charging station. We do not offer adult learn to swim lessons.